The PieCaken is the best Christmas baking idea we've ever heard. OMG: A pie cross cake hybrid has arrived just in time for Christmas. Festive baking and mince pies are two of the best things about the Christmas period. But Jody Allen from Stay at Home Mum have combined both things in the form of her glorious PieCaken creation and you don’t have to be a wiz in the kitchen to recreate it. The recipe is stupidly simple and all you need is six mince pies and a packet of cake mix. 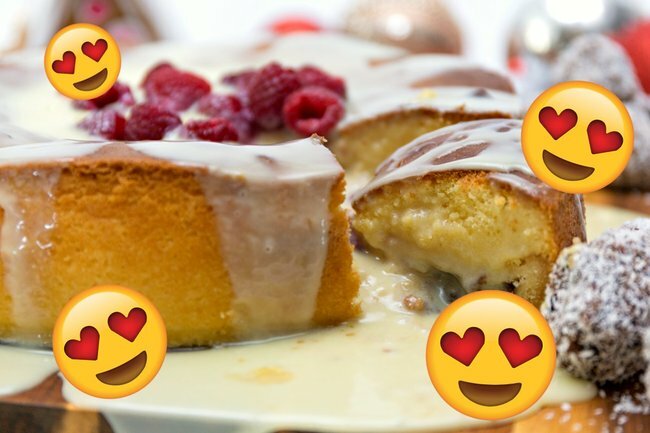 You then pretty much bake the mince pies with cake and in under an hour you’ve got a super impressive, festive dessert for less than $20. It’s also a great way to use up any left over, or discounted, mince pies after Christmas, so you can savour the glorious and delicious pastry past December 25th. Here’s how to make one for yourself. 2. Grease a 22cm Springform pan well with butter or canola spray. 3. Make up the Vanilla Cake Mix from the Woolworths Vanilla Cake with Tray Kit (you can ditch the icing, tray and Rainbow Sprinkles) according to the instructions on the back of the packet. 4. Once the batter is ready, pour enough cake batter on the bottom of the Springform Pan to cover the bottom (about 1/3 of the mix). 5. Carefully remove the Woolworths Fruit Mince Pies from the packet. Space them evenly around the outside of the cake pan (but not touching the sides) and one in the middle. 6. Pour the remaining cake batter over the top. 7. Tap the base of the Springform Tin firmly on the bench a few times to ensure the batter totally gets in and around the Fruit Mince Pies. 8. Pop in the oven and cook for about 40 minutes. Use a skewer to ensure it is cooked through. 9. Release from the pan, and serve warm! For serving suggestions, Jody recommends serving your PieCaken warm with a generous drizzle of custard and ice cream. For an extra professional flourish cut exactly into the middle of a mince pie when serving. You can do this by popping a toothpick into the centre of the pies before you pour the remainder of the batter over the cake. Will you be making the PieCaken for Christmas? What’s your favourite festive baking treat? Tell us in a comment.